Born in Grantham in 1880 he came to Nottingham as a child and served the Bulwell Forest club there for his entire career, starting as the county’s first caddy at the age of seven. 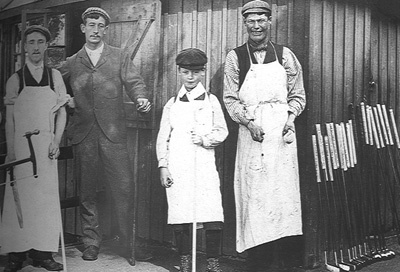 As a member of the Artisans Club, he won their challenge cup as a fifteen year old then won it again before going to North Berwick to learn clubmaking from James Hutchison. At the age of 16 he was appointed professional to Bulwell Forest and entered the Open Championship for the first time the following year. He played in the Open on more than forty occasions, finishing eighth in 1899 as a teenager, seventh in 1907 and 1913 and fourth in 1914. He played nine times for England against Scotland between 1904 and 1913, losing only one match, and captained the team in 1909. His brother, Hugh Williamson, was also a professional golfer. He was professional at Bulwell Forest for more than 50 years and died in 1950.